Paprika and garlic salami. Try Boldog diced with soft scrambled eggs! Format: Similar to a Hungarian salami or Spanish chorizo. Casing/Seasoning: In pork after ends casing, with paprika peppers, garlic, black pepper, and red chili flake. Spicy fennel and garlic salami. Try Big Chet’s sliced on a baguette and add the hard ends to a giardiniera or ratatouille! Tasting notes: Like its smaller counterpart, the fennel and spice of the red pepper play nicely with the garlic and white wine, making Big Chet's a classic and balanced salami. Spicy fennel and garlic salami. Chet’s is great in pasta with summer tomatoes. Tasting notes: The fennel and spice of the red pepper play nicely with the garlic and white wine, making Chet's a classic and balanced salami. Smoky, spiced salami. The Chuck Fred is great on its own or as a topping on a fresh pasta with greens. Tasting notes: A Mike Phillips original, this salami has Eastern European influences, soft spices, and a light smoke perfume. Big, hot salami! Salbando Grande tastes great on a sandwich with some aioli and a mild cheese. Tasting notes: A larger version of our take on a spicy salami, Salbando Grande is still subtle, but the spice blossoms as you eat more and more...and more. White wine, white pepper, and garlic salami. Salami François sliced on a baguette with butter is the best! 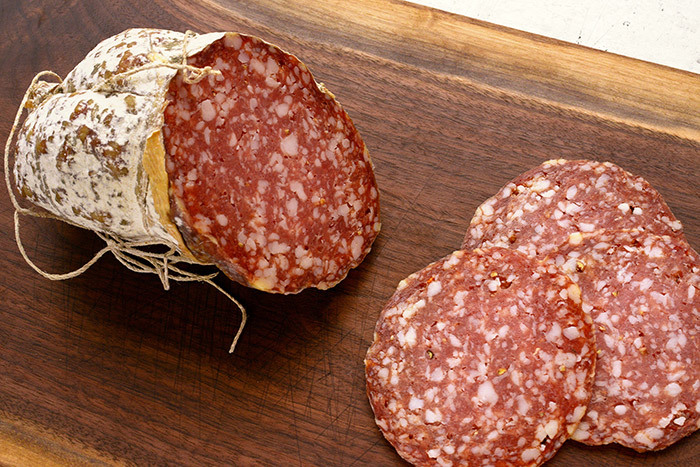 Tasting notes: Salami François is subtly perfumed and has a finer ground than most others. The seasonings help to celebrate the meat itself.